The iPad rumor mill is finally starting to churn a little more over the last couple of weeks – and it’s about time since October has become the new standard timeframe for new iPad launches. This week’s iPad rumors are in keeping with the general theme of low expectations for October iPad announcements. — Expect a new iPad Air next month – with not a huge amount of change to it, but adding the TouchID feature, likely a little slimmer, and possibly 2GB of RAM. 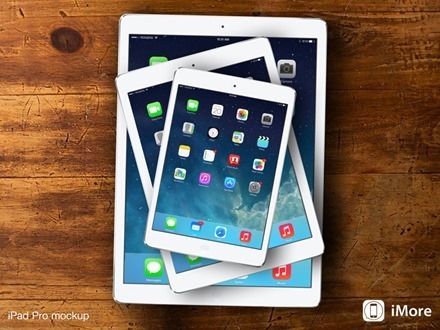 — Either a Retina iPad mini with very little changed or no new Retina iPad mini until Q1 of 2015. — Then the long-rumored iPad Pro – at a whopping 12 or 13 inches – but the middle of 2015. I’m a Retina iPad mini user and enjoy the smaller form factor, so of course I’m hoping that these latest rumors are wrong about the lack of a new mini until early next year. I am looking forward to seeing Touch ID on the iPad though, and the iPad Pro has always sounded like a natural addition to the iPad line. It shouldn’t be too long now before at least some of these rumors become actual announcements from Apple. Why is this site do unbelievably clunky, on an iPad Air, no less. Can’t get rid of repeated CNN ad. Won’t optimize landscape or portrait? Would like to patronize and home screen the site but something is wrong. My primary concern for the iPad mini regards the display color gamut. The current display covers less than 70% of the sRGB color gamut, resulting in washed out colors and less realism and accuracy. Competitors offer higher quality IPS displays with ~100% sRGB gamut for a little more than half the price of the Mini. I’d like to see iPad displays of the same laminated design as the iPhones. Such displays would befit the rest of the expected iPad hardware (A8 and fingerprint sensor). I’d also welcome lighter iPads, but not at too much a cost to battery life. Guess all we can do is wait and see. I’ve got the cash set aside for Apple if they come through.